Crown Recycling Facility is a family owned and operated, full service recycling center in Suffolk County, Long Island. Established in 1970 by the Rossano family, Crown has served the community in all its recycling, solid waste disposal, scrap metal, and demolition needs. As a recycling center we help the community to be good stewards of the environment by providing a second life for reusable and recyclable materials and by properly disposing materials that cannot be recycled in a safe and professional manner. Scrap Metal. We gladly buy all types of scrap metal and pay the most competitive prices possible. We can pick up your scrap metal at your location and weigh it with our portable scale box truck or we can deliver a roll-off dumpster for your convenience. We purchase: aluminum scrap windows, siding, doors, copper, brass, brass faucets, stainless steel, wire, motors, radiators, batteries, lead, tin, steel, cast iron, nickel, zinc, die cast, computers, and electronic scrap. We provide; barrel service for fabrication shops, container service for fabricating shops, box truck pick-up service and weigh and pay on the spot container service for large demolition projects or construction sites. Roll-off Containers. We provide a wide range of sizes of roll-off containers for scrap, construction and demolition debris, damaged trees, house debris and solid waste, for both businesses and individuals. We can supply you with containers ranging from five-yards to 40-yards, 120-yard walking floor trailers, and 55-yard dump trailers. We can help with anything from small cleanups to major building renovations and demolition projects. With our fleet of late model roll-off trucks and tractor trailers we are fully capable of serving all of your trucking and disposal needs. Asbestos. We can provide sealer or open-top containers ranging from 30-yards to 40-yards for both friable and non-friable asbestos waste and contaminated soil. Our employees are licensed and trained to haul and dispose of all types of friable and non-friable asbestos. We provide you with a manifest and licensed landfill disposal locations to help you stay in compliance. C & D Recycling. No job is too big or too small for us. We can handle the disposal of all demolition and construction debris, contaminated soil, asbestos, and waste tires. 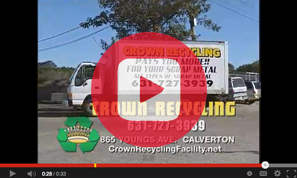 Whether you need recycling, solid waste disposal, scrap metal or demolition services, Crown can help. Our goal is to provide our customers with high quality service for competitive rates, and to make it as easy as possible for you to get the recycling services you need. We care about our community and work hard every day to preserve our environment through aggressive recycling. If you have any questions about our services or how we can help you, please contact us online or call (631) 727-3939 to speak to one of our helpful staff. Please contact us and advise your container size, location drop off and any other details you would like us to know. We proudly serve all of Long Island. Call us to talk to our agent Live!